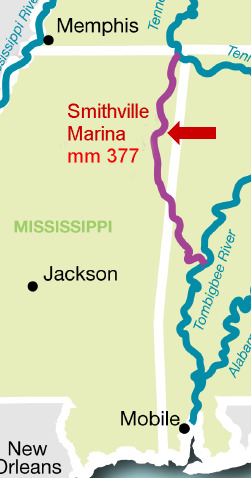 Smithville Marina is conveniently located on the Tennessee-Tombigbee Waterway, on the east bank at mile marker 377, immediately north of the Glover Wilkins Lock and Dam. We monitor marine Channel 16. Click Here for a satellite view of the Smithville Marina area complete with arrows helpfully guiding the way in. Off Channel. At upper end of Wilkins Lock, turn east and proceed one-half mile to marina. 8' depth. Restaurants, airport nearby. Transient docking with call - Ramp - Rest Rooms/showers/laundry; groceries nearby - courtesy car. Smithville Marina specializes in harboring transients!